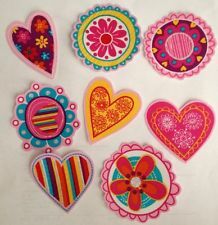 Hearts and flower Medallions - Iron-On Fabric Appliques Includes one set of 8 Pretty Appliques made from quality cotton fabric with an iron on backing. These are perfect to decorate for any season, celebrate the fall harvest season or summer picnics. Make t-shirts sweatshirts tote bags or embellish placemats, jeans, overalls, aprons pillows or more. Each area about 2" to 2 1/2"